GREAT BRITAIN'S VOTE last month to exit the European Union has been widely described as the country's most consequential decision in decades. But its significance is paltry compared to that of history's original "Leave" resolution, the 240th anniversary of which Americans commemorate this Fourth of July. The unanimous vote in the Second Continental Congress, which affirmed that "these united colonies are and of right ought to be free and independent states ... absolved from all allegiance to the British Crown," was the most far-reaching political event of the 18th century. John Adams, writing from Philadelphia to his wife Abigail, called the vote not just "the greatest decision . . . which ever was debated in America," but possibly the greatest that ever "was or will be decided among men." 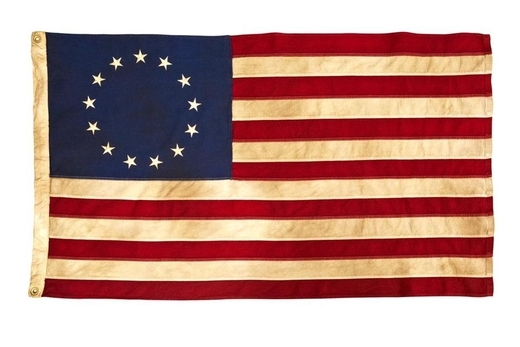 And yet, for the longest time, sentiment in the American colonies strongly favored "Remain." Even after the Boston Massacre and the Boston Tea Party, even after Parliament had enacted Lord North's detested Intolerable Acts, countless Americans still craved a peaceful compromise with London. It was a sentiment their leaders expressed repeatedly. In a published message to "friends and fellow-subjects" in Ireland, for example, the Continental Congress gave its assurance that "America still remembered her duty to her sovereign" and, "though insulted and abused," continued to "wish for reconciliation." Despite being "charged with rebellion, [we] will cheerfully bleed in defense of our Sovereign in a righteous cause," the statement averred. "What more can we say? What more can we offer?" As Pauline Maier showed in American Scripture, her acclaimed 1997 study of the making of the Declaration of Independence, many of the most radical Founders clung to the hope that America might remain in the empire. As late as August 1775, four months after Lexington and Concord, Thomas Jefferson could still write to a correspondent "that he sincerely wished for reunion and 'would rather be in dependence on Great Britain, properly limited, than on any nation on earth, or than on no nation.' " What the Americans objected to was not the authority of the king — many, like Benjamin Franklin, had been devoted royalists — but the authority of a Parliament in which they had no voice or vote. By the start of 1776, however, hope of reconciliation was gone. King George had (falsely) proclaimed the colonies to be in "open and avowed rebellion," and demanded "the most decisive exertions" to crush them. He signed into law a "Prohibitory Act" banning trade with the Americans, and declaring open season on American ports and ships. In a New Year's Day attack, British troops bombarded and burned Norfolk, Va. Soon after came word that thousands of additional troops were crossing the Atlantic to quell colonial resistance. Americans had been raised to think of themselves as Englishmen and to revere the English king. Now it was becoming clear that they'd been clinging to a delusion. 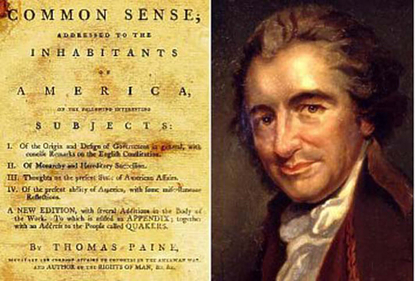 In January 1776, with superb timing, Thomas Paine published "Common Sense." It was a scorching denunciation of the "royal brute" in London, and it appeared just as Americans were coming to grips with the realization that they could no longer profess loyalty to an empire that had rejected them. "Everything that is right or natural pleads for separation," Thomas Paine argued in his political manifesto "Common Sense." Americans had evolved into a new nation, and they were entitled to sovereignty and self-rule. "Common Sense" was a runaway bestseller. It sold more than 150,000 copies — astonishing in a country with a population of just 2.5 million. It was "greedily bought up and read by all ranks of people," marveled Josiah Bartlett, a congressional delegate from New Hampshire. Paine's manifesto was a ferocious attack not just on England's abusive treatment of the colonies, but on the very idea of monarchy itself. He mocked the "farcical" notion that Americans, being largely of English descent, must remain under English rule. William the Conqueror had been a Frenchman, he pointed out, and "half the peers of England" were of French descent. Did it therefore follow that England must be governed by France? "Everything that is right or natural pleads for separation," Paine argued. "The blood of the slain, the weeping voice of nature cries, 'Tis time to part. Even the distance at which the Almighty hath placed England and America, is a strong and natural proof, that the authority of the one over the other was never the design of Heaven." He was making more than a political point. Paine was urging Americans to fight for independence not only because George III and Parliament had betrayed them, but because they were no longer Britons. America's people had evolved into a new nation, and that new nation was entitled, by the very "design of Heaven," to sovereignty and self-rule. A few months later, that idea would be enshrined in the opening words of the Declaration of Independence. The colonists had become "one people," and it had become necessary for that people to sever its ties to England and become a wholly independent power — to claim "the separate and equal station" in the world that it deserved. And who had authorized American independence? Not English ministers or foreign diplomats, but "the laws of Nature and of Nature's God." In the Declaration, Congress laid out America's case to "a candid world," because Americans wanted to show "a decent respect to the opinions of mankind." But respect for world opinion did not imply a willingness to submit to it. The colonies weren't asking for their independence. They were asserting it. They had made up their minds to leave. No longer could anything induce them to remain. "We have it in our power to begin the world over again," Paine had written. "A race of men, perhaps as numerous as all Europe contains, are to receive their portion of freedom." Americans were the first nation in history to declare independence, replacing rule by a king with rule by consent of the governed. It was a transformation that permanently altered the course of human events. Long after "Brexit" has been forgotten, the events of 1776 will still be reverberating.